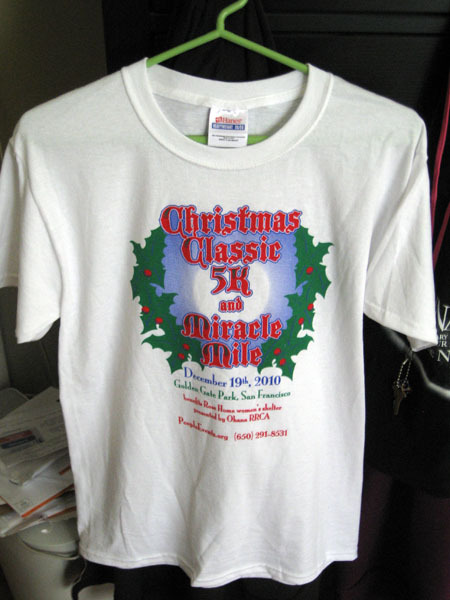 On December 19, 2010, I ran the Christmas Classic 5K in Golden Gate Park. I signed up for this race several weeks in advance, so I was pretty bummed out by the fact that I had fallen prey to head cold #1 (I’m still recovering from the second cold as I type) days before the race. I felt even worse when I found out that it was going to rain and be nasty out during the race. I had never raced in bad weather before and I wasn’t entirely sure that running in rain and wind was going to be good for my cold. Lastly, I was sad that I might miss out on getting another race shirt. Since I’m not a long distance runner and don’t have medals, race shirts are my only form of fitness bling. Boo-yah. I debated bailing on the race in this post, but when race day came, I just decided to go for it. I might drop dead trying, but I was going to finish and get my damn t-shirt. A couple of days before race day I hit up Sports Authority for some inclement weather gear. I didn’t really have a track jacket or hat, and I knew that I needed them for the race, especially given my health at the time. 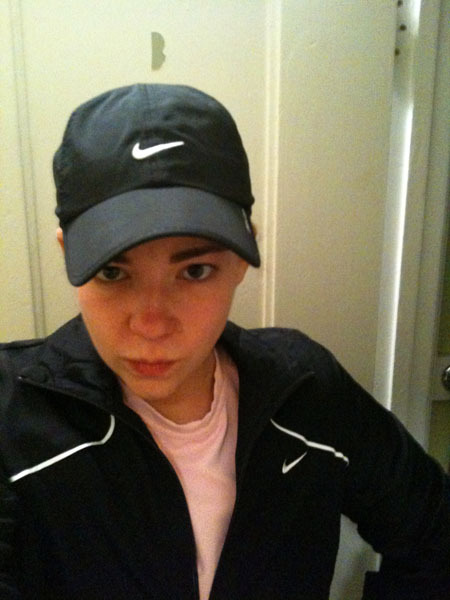 I picked up a super cute Nike jacket that was on sale and a Nike cap. I had wanted gear that wasn’t black, as everything I own is black, but in the end, it’s what I wound up with. The night before the race I was getting excited, so I decided to model my gear. I’ve looked back on my camera, but I can’t find any pictures of breakfast. It was almost a month ago, but I think I had a cup of coffee. I also probably had some kind of nut butter and a banana on a slice of either Great Harvest Dakota or Brown bread. I guess this as I always have peanut butter and banana on toast before a race and secondly, I guess this because it’s the only food I really had in my house during the month of December. Oops. I was running (ahahaha. punny. ok. not really.) a little late that morning and I managed to navigate the distance to the 5 Fulton stop on McAllister and Divisadero just in time to see the bus drive by. Very reminiscent of my Run Wild For A Child morning, no? The only difference is that this time, I couldn’t hustle enough to make it. I had a full Clipper Card this time and everything. Le sigh. Do-dee-do. Guess I’ll just have to wait then. 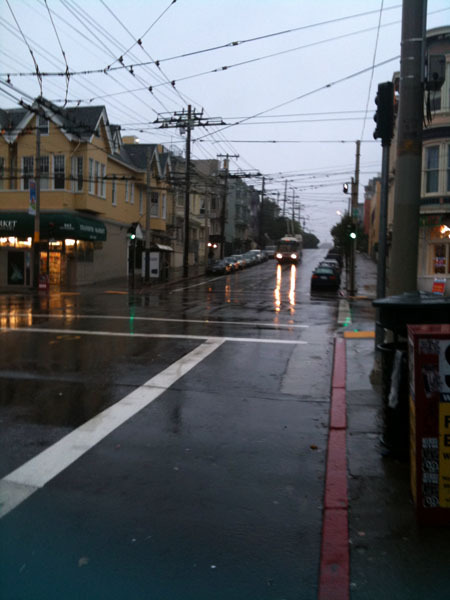 As I stood there in the bus shelter, the wrath of God poured down on San Francisco. Seriously. The wind was blowing so hard I thought the shelter and I were going to be obliterated. 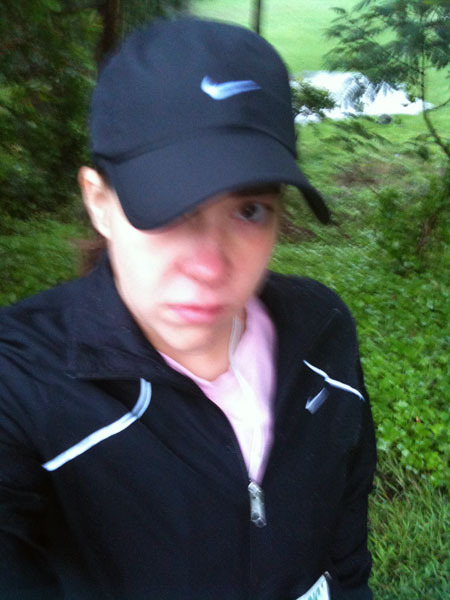 I was getting soaked because it was raining sideways, into the shelter. I was freezing and wondering what exactly I was doing out of my bed and out in the cold, harsh world. I figured they would know where to go. After I got there, I picked up my bib and started my great restroom search. The brilliant folk from the park sort of forgot to unlock them so all of us were pacing around from bathroom to bathroom trying to find the magical open one. Eventually a park employee came and opened up. I got in there before he closed it to be serviced and stocked. Fine by me. No line. Woo. After all of this rain, wind, and bathroom searching, I was starting to feel crappy, tired and blurry. Out of focus. Ick. I went to huddle with the other people who would be running the 5K. There was also a mile race, so all of us 5Kers were waiting on the mile race to end. I saw my co-worker run by super fast. Impressive. All of us cheered on the runners. The rain had stopped somewhere during all of this and all of the happy vibes from the cheering started to brighten my spirits. Eventually it was time for the race to start. I didn’t have high expectations. I just set out to finish and do the best that I could, given the circumstances. The first mile was pretty tough, just because it was up an incline. I never run up hills, save maybe racing up one block from Oak to Page on Broderick after my Panhandle runs. I never actually train for hills. This wasn’t steep, just a steady climb. I really didn’t want to stop, so I just kept at it, which I think was probably a bad idea. I kind of burned through my energy really early. During the other 2.1 miles I did a lot more walking than usual, as I was struggling with breathing…my sinuses were shot. Despite the difficulties, I was having fun. Race workers said encouraging things when we hit certain points. I watched little kids running with their parents and siblings, the elder family members trying to motivate the young ones to keep going and “finish strong”. Finally, I saw the finish line ahead. 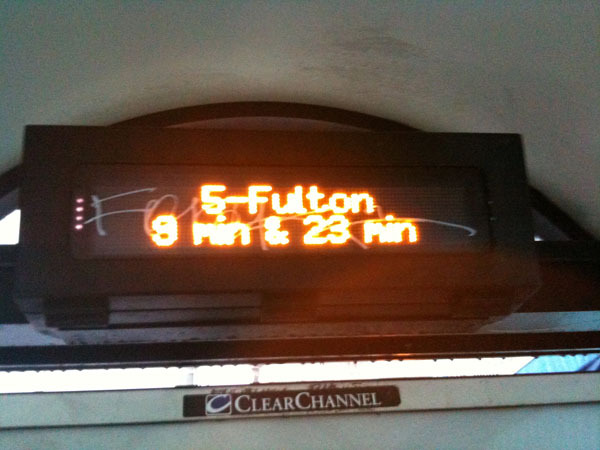 I was sad to see that it was already past the 33 minute mark, but even more sad to see 34 minutes approaching. I ran as hard as I could, but I just couldn’t make it in under 34. I posted this video on New Year’s Eve when I discovered it had been uploaded onto YouTube. I had anticipated it being very difficult to locate myself, so I just clicked on the third part and started scanning for myself. Luckily, it didn’t take very long. I am the first person to cross the finish line in this hunk of video footage. Score! As I crossed the line a race worker exclaimed, “300! You’re here! Good!” You can hear it in the video. Then I continued on down the chute and someone handed me a lollipop. Nice! I made my way over to the post race festivities and picked up my t-shirt, water bottle and swag bag. Then I saw what kind of munchies they had going on. Cheese…..and DOUBLE RAINBOW ICE CREAM! w00t! You got to choose between chocolate and mint chocolate chip. I’m a chocolate girl, always. Those are the legs of a fellow runner. He was chatting with a mother and son who had just finished racing. Then he talked to me for a bit. People at races are always so friendly and nice! After a few minutes I sought out my co-worker to say hi. We chatted. 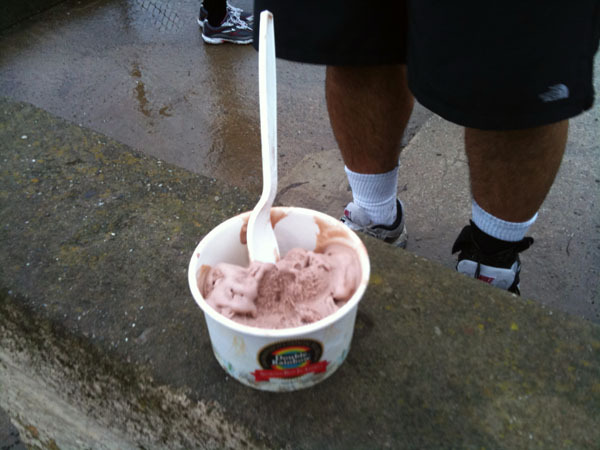 Then I started on my walk home, happily eating ice cream and feeling accomplished and chipper. I passed a family and I remembered the little boy. He had passed me up during the race! I watched him as we walked…he was eating his lollipop and his ice cream at the same time. I smiled and told him that he was really fast. He didn’t have much time for me…eating two desserts for breakfast is hard work. His mom smiled and made a few comments though. I really enjoyed this race. It was small, low-key and fun. I was able to not care too much about my time and just get out there and run, which is really what is important, right? I mean, who cares if you ran your 3.1 miles in 20 minutes or 40 minutes? It’s still 3.1 miles, and it’s still awesome. I wish I could get that fact through my thick skull more often. The only thing I didn’t really like about the small race factor is the hand scoring. I had to wait two weeks to hear any word about my official time. Sure, I just said above that time wasn’t important, which is true, but that doesn’t mean I don’t want to know it just for my own records, memories and blog posts! The first step towards an official time was the above linked video. Then a day or two later they posted my time…. If you look at the video, I came in at around 34:02. My RunKeeper says it’s 34+ minutes also. Where did 31:22 come from? I e-mailed the timing people from the race and asked about it…they said it is correct. It’s not that time matters all that much….except that now my PR on Athlinks is a time that I didn’t earn. It bums me out a little bit that it isn’t accurate. I can’t believe my luck…two races in a row where there were timing issues. Maybe it’s Golden Gate Park. Perhaps it’s cursed…. Have you ever had timing problems with a race? Okay, I talk a lot. But I just want to say that considering the conditions (nasty weather) and your health (nasty cold), you had a really speedy race. You should be proud! Congrats! Hope to say “hey” to you at a race soon! 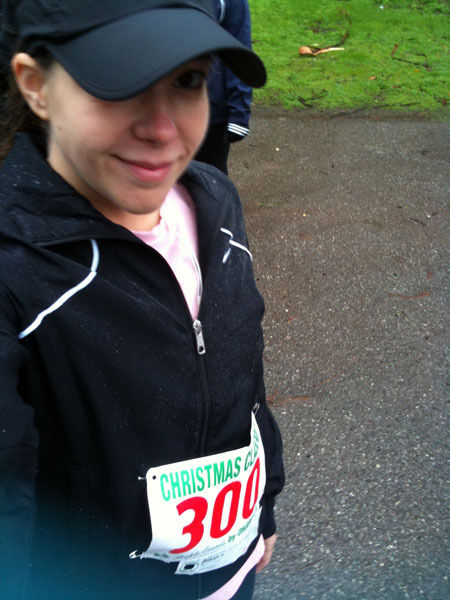 (P/S: I joined the DSE running club as a New Year’s Resolution, so I hope to make it to some of the smaller races. 🙂 ) I think you said you might to the Arts & Sciences 5k that’s at the end of this month, right?